WILLIAM LAWS. This gentleman is one of many who have spent the greater portion of their lives in developing the country, that their children and grandchildren might enjoy the advantages which they themselves were denied. In truth, we to-day are the "heirs of all the ages" and profit by the labor and self-denial of the hard-working classes of time past. Mr. Laws was born in Todd County, Ky., November 15, 1826, and is a son of Fielding Laws, who was born in North Carolina. In that State the elder Mr. Laws was reared but he later moved to Kentucky. 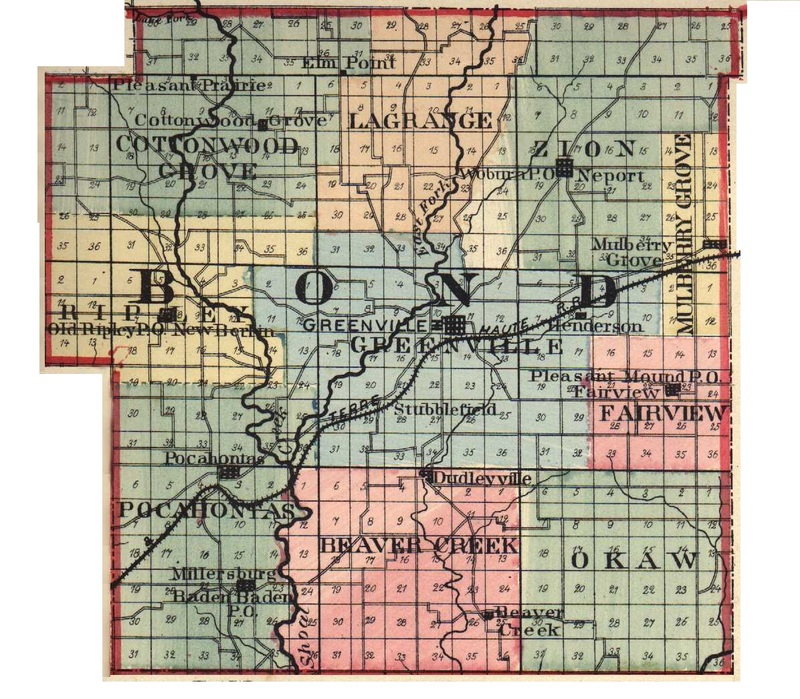 About 1830 be came to Bond County, Ill., took up land from the Government, and made his home on the same until his death, when seventy-four years of age. The grandfather was a native of Virginia, in which State he passed his entire life. He was of Irish descent. Fielding Laws married Miss Betsey Vaughn, a native of Kentucky, where she was reared and married. She lived to be about sixty-eight years of age. Her father was a native of the Emerald Isle and when a young man came to America. Our subject's father and mother were the parents of eleven children, nine of whom grew to manhood and womanhood, married and became heads of families. One of these has since died. Our subject, the eldest of these children, was about four years of age when he came with his parents to Bond County, Ill., and his schoolboy days were spent in the little log schoolhouse of pioneer times. He remained with his parents until twenty-two years of age, and in May, 1848, was married to Miss Mary M. McCaslin, a native of Caldwell County, Ky., born November 26, 1828. She came with her parents to Bond County, Ill., when about three years of age. Her father, Thomas McCaslin, was born in Kentucky, as was also her mother, Sarah (Robinson) McCaslin, and both were of Irish descent. After his marriage our subject located on the section where he now lives and began life in a very primitive and simple way. He first built a small log house, 16x16 feet, of round logs, with no windows, puncheon floor, clapboard door, and mud and stick chimney. He had sixty acres of raw land to start, with, one yoke of oxen and one cow. Although this young couple started out under rather unfavorable auspices, they were ambitious and frugal, and by hard work and good management soon began to gather around them many of the comforts and conveniences of life. Mr. Laws is now the owner of three hundred acres of land, all under cultivation, and in connection with agricultural pursuits is engaged in stock-raising. He and his estimable wife have made all their property by their own exertions and can now pass their declining years in peace and comfort. As the years crept along, children gathered around the fireside, three daughters and six sons, who were as follows: Sarah E., wife of John McLean, of Bond County, Ill.; Thomas G. (see sketch); Lucinda M., widow of O. F. Lewy, of East Fork Township; Alfred W., of Bond County, Ill.; Fielding F., also of Bond County, Ill.; Mary E., wife of Charles Linder, of East Fork Township; Charles L., also of East Fork Township; William H. and Albert P. (deceased). All these children were reared on the farm where our subject now resides and where he has spent the principal part of his life. He is one of the first-class citizens of the county, and during his long career here not a word could ever be said against his honesty and uprightness. He has been a Republican since the war and has held a number of official positions in the township. He is interested in educational matters and was School Director for some time. In every laudable enterprise he takes an active part and is a public-spirited citizen. Extracted 21 Dec 2016 by Norma Hass from 1892 Portrait and Biographical Record of Montgomery and Bond Counties, Illinois, pages 474-475.